Thanks to its face-recognition tool, iPhoto ’09 ( ) can now put names to the faces in your photographs, letting you quickly sift through your library based on content rather than how photos are arranged. But putting this feature to work requires some effort on your part. If you haven’t used the Faces feature yet, here are the basics. 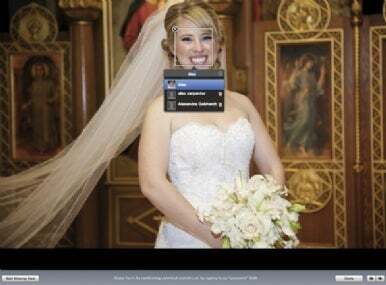 Once iPhoto is finished, you can start assigning names to detected faces. Select a photo in your library that contains a face, select the Name icon, and then enter a name in the Unnamed field below a face. As you type, iPhoto will suggest matches from Address Book or from other faces you’ve named. If there are multiple people in the image, you can tab between the name fields to identify everyone. Once you’ve assigned names to a few faces, the fun starts. iPhoto will learn from your input and try to put names to faces on its own. To help it along, click on Faces in the Library pane. You’ll get a corkboard with entries for every person you’ve identified. Double-click on a person’s name, and you’ll see two areas. The top includes photos of the person you’ve identified. Beneath a gray bar are other people whom iPhoto suspects may be the same person. Click on the Confirm Name button to begin the verification process. Each time you confirm a correct instance or reject a wrong guess, the application gets a little smarter. 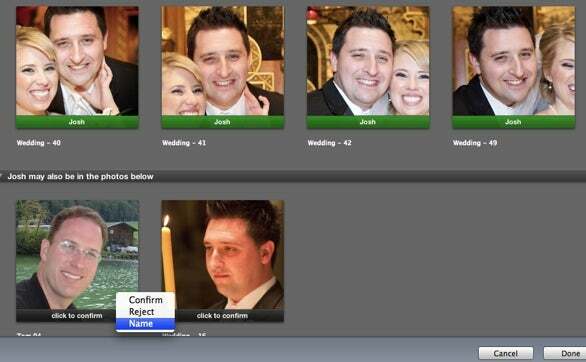 As you type a name, iPhoto will suggest people from Address Book or people you've previously identified. When you’re in Confirm Name mode, you can click and drag across many thumbnails to confirm them quickly. This is much faster than clicking on individual thumbnails. Hold down the Option key and drag to reject many faces at once, or double-click to reject individual shots. By the way, you can confirm guesses without actually switching to Confirm Name mode. Simply drag thumbnails from below the gray line into the list of already-identified thumbnails to quickly add them to the collection. Telling iPhoto when it guessed incorrectly is helpful, but even more helpful is telling iPhoto to whom the errant face actually belongs. With iPhoto 8.0.2 or later, you can Control-click on a thumbnail in Confirm Name mode to assign a different name to a person. If iPhoto includes the wrong person in your confirmation pane, go ahead and give him or her the right name, as shown in the lower left corner. Waving the mouse over a picture on the corkboard and scrubbing through dozens of shots of Aunt Jane is lots of fun, but the effect can be hard to control. For a more relaxed experience, just park the mouse over the corkboard picture and use the right- and left-arrow keys to view one thumbnail at a time. Hold down the Option key to see the entire composition, not just the closeup of the face. Once you find a shot you really like, hit the spacebar to set the shot as the key photo for the corkboard. As you’re scrubbing through images on the corkboard, you can go straight to Edit mode for a picture by Control-clicking and choosing Edit from the contextual popup menu. Once you’ve identified friends and family, you can combine face recognition with smart albums for some serious organizing horsepower. Here’s an even faster way to create a smart album: simply drag the person’s thumbnail from the Faces corkboard to the Library pane. iPhoto will build a new smart album will all photos tagged with their name. To build a smart album that searches for multiple people, Command-click on each person and drag them to the Library pane. You can modify the album further if you wish by Control-clicking on it and choosing Edit Smart Album. Want to quickly see whom you’ve missed? Smart albums can accomplish this, too. To build a smart album that displays all of the faces in your library that have yet to be named, set the menus to read Face Is Unnamed. Each time you identify one of the unnamed faces in a photo, it will disappear from the smart album. This smart album will track down faces that aren't assigned a name. If you have a falling out with someone you’ve already identified in your photos, it’s easy to remove him or her from view. Drag the person’s snapshot from the Faces corkboard to the Library pane. In the resulting smart album, go to Edit -> Select All to choose all of the images, and then click on the Hide button on the bottom toolbar. The images containing that person—including group shots—will disappear from the iPhoto Library. They’re not deleted, only hidden. (If you still see them, make sure the Hidden Photos option isn’t selected in the View menu.) If you have a change of heart, you can quickly make the person reappear by going to View -> Hidden Photos.